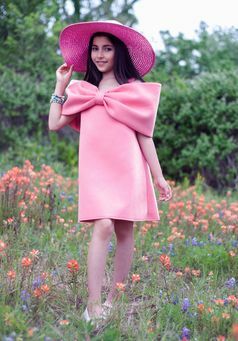 This sweet girls dress from a popular Korean designer Airfish practically screams "it's spring!" Crafted in the most cheerful shade of mango, this adorable spring dress features some of today's runway-ready trends, such as oversized bows, a-lines and scuba fabrics. She will deinitley look stunning and will say "yes" to this dress!